When you think of a baked potato, you probably picture a whole potato wrapped in tinfoil. I love those at restaurants when they're coated in sea salt, but they can take awhile to cook. Speed up the process and make it a meal with this recipe that's somewhere between a loaded baked potato and baked french fries! Cut the onion in half and slice against the grain so you're forming half-circles. Cut each half-circle in thirds to form rectangular chunks. Put the onions in the bowl with the drained potatoes. Add about 2 tbsp olive oil. You may need a little more depending on how big your potatoes are. You just need enough so that they all get a touch of oil. Add seasoning (TexJoy, salt, pepper) to taste. I like my food heavily seasoned, so I sprinkle the seasoning until I see a nice coat of color on the potatoes. Then I stir the mixture really well, add more seasoning and stir again. Transfer the potato mixture to a large baking dish or baking sheet. If you have a cookie sheet that has a lip around the sides, that would be perfect. 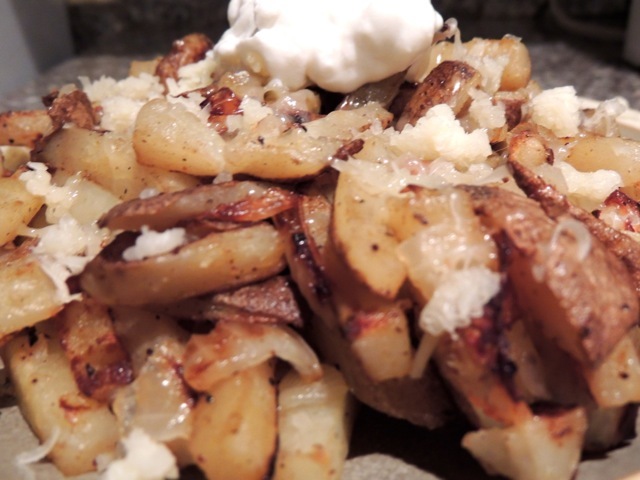 Ideally, the potatoes will be a single layer in the baking pan. You may need to use more than one pan. However, not to worry if your potatoes are stacked on top of each other. Put the baking pan in the preheated oven. If your potatoes form one layer, set the timer for 20 minutes. Baking times vary, but the potatoes are done when they're crisp, golden brown and you can easily stick a fork in them. If necessary, taste one to see if they're done! If your potatoes are not in one layer, set the timer for 10 minutes, take the baking pan out of the oven and stir the potato and onion mixture so that everything bakes evenly. Place the baking pan back in the oven and set the timer for 10 minutes again. The potatoes may need 30-40 minutes total cooking time. Stir every 10 minutes. When potatoes are done, take the pan out of the oven and transfer to a serving dish. Sprinkle evenly with cheese (cheese will melt in a few minutes), and place dollops of sour cream on top. Enjoy! The hardest part of this recipe is all the chopping. You can make it a little easier with this nifty gadget to the left. We bought ours at Bed Bath and Beyond. 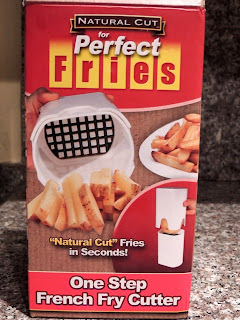 One push, and a whole potato becomes perfectly chopped fries. I grew up in Ohio farm country, and my grandparents grew potatoes on their farm. That's probably one reason I love eating potatoes so much. I'm sure this will be the first of many recipes featuring my favorite starchy vegetable.